THE VERNEH RUG - Typically woven in a striking palette of primary reds and yellows and blues. Framed by the Black and Caspian seas, Caucasia lies atop one of Eurasia’s most significant cultural fault lines, the great divide between East and West, North and South, Europe and Asia, Persia and Russia. The land itself is harsh and beautiful, befitting the gap between nations: in the west, the Caspian mountains rise from the Caucasus like some curved spine of its central plains; and the plains, in turn, roll on to the interior horizon. In language, culture, and art, Caucasia is one of the most diverse land masses in the world, a pressure cooker of juxtapositions, motherland to divergent nations now composing the modern states of Armenia, Azerbaijan, Georgia, as well as the culturally distinct regions of Northern Iran and southern Russia. It has long been a flashpoint of these competing peoples and powers, and it has endured a centuries-long history of integration and separation, peace and war, renaissance and long stagnation. Through it all, there has been at least one rooted constant, and that is the long tradition of native art that has for centuries been quietly reflecting the region’s conflicted diversity. Internationally, this art has achieved what is perhaps its greatest fame in Caucasia’s tribal and village textiles—tapestries, rugs, and clothes—and high among these is the subtly compelling form we know today as Verneh. Verneh, in the nomenclature of antique rugs, refers not only to the design, but to the construction of a broad category of Caucasian village rugs that were woven in the mid-19th through mid-20th centuries. 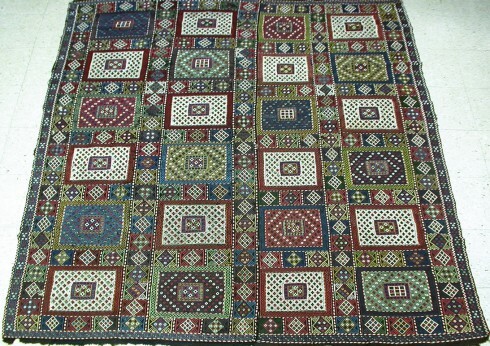 The Verneh rugs were woven in the Soumak style, a technique that creates a flat-weave textile similar to the Kilim, but more complex, thicker, and significantly more durable. Soumaks have no pile, and the Verneh used this difference in construction to reimagine classical design. Most were produced under official Russian rule, and in this respect they can be considered a part of the textile renaissance of the 19th century, which was a conscious response to demand from the international market. But in another respect, the Verneh rugs stand distinctly apart from the renaissance, and apart from the Turkish, Persian, and Caucasian carpets sold to the west. Unlike the piled carpets of their same era, the Verneh rugs do not seem to have been explicitly produced for any existing market. 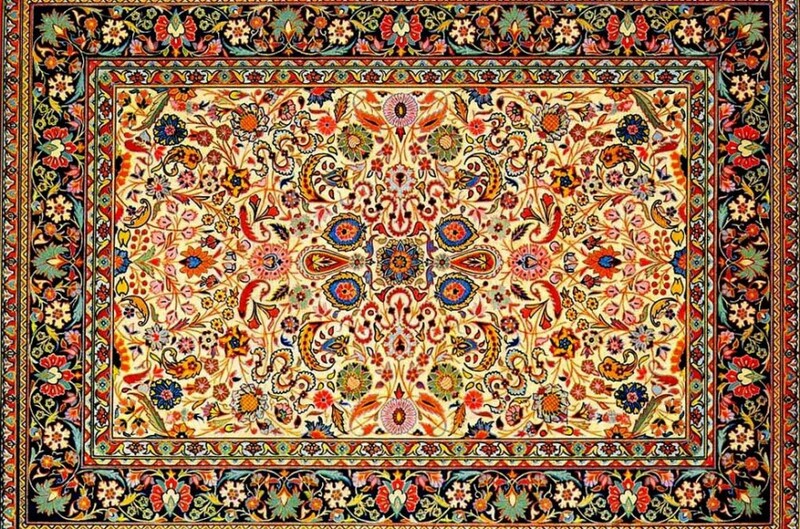 Where the piled carpets drew on classic Turkish and Persian motifs favored by Russian and Western taste, the Verneh designs do not overtly reference any classic canon. Their exact origin and intent remains unclear; why, for example, the Soumak weave as opposed to the more common knotted pile? Why, deepening the enigma, is there little evidence of Soumak weaving even existing in Caucasia prior to the mid 19th century? The form cannot have come out of nowhere, but its roots have not been found. Part of the great appeal of Verneh rugs is not only the mystery of their lineage, but also their seemingly defiant local aesthetic and construction. The striking, boldly-patterned rugs stand out immediately among their antique Turkish and Persian cousins. Designs are derived from a wealth of classic sources, from 16th century Caucasian workshop rugs, to classical Persian floral carpets, to Turkish carpets of the 15th and 16th centuries. Verneh rugs, using the Soumak weave, give each of these original designs new form. With simpler construction, Verneh carpets appear as almost modernist distillations. Densely baroque motifs are opened out, made more spacious; curvilinear patterns are simplified and become more geometric. In perhaps the most fascinating example of distillation, many Verneh rugs feature repeating, S-shaped, geometric abstractions. Evidence suggests these S’s are not letters, but are in fact the simplifications of dragons, classic figures in the eponymous Caucasian Dragon Rugs of the 16th through early 18th centuries. The rugs are typically woven in a striking palette of primary reds and yellows and blues, though in certain beautifully age-worn examples, these bold primaries have mellowed and taken on a lovely patina. Some of the larger, more formal Verneh rugs make use of a rarer purple dye, which combined with brilliant golden accents in the border, lends a formal elegance to large-scale examples of the form. These are highly valued carpets, and very desirable on the collector and designer markets. They can seem strikingly contemporary, with bold, sharply drawn, repeating patterns more typical of modern design than they are of 19th century village antiques.